Personal Branding is a path of authenticity and living aligned with your truth and for some it can be a path of owning your worthiness as well. In my decade of experience as a solopreneur, I have certainly had my own story of worthiness and feelings of "Who am I?" to be following my passions and guiding others on their journey. And I have found that so many others also ask themselves this very question. In this Personal Brand Spotlight video interview I chat with Thais Sky, a life coach and speaker who coaches visionary entrepreneurs, creatives, and emerging leaders who are ready to dispel the pervasive, unrelenting sense of unworthiness on how to explore, trust and express themselves unapologetically. In our conversation we talk about her own story and experience of worthiness as a personal brand herself, how to bring awareness to the potential of your own wound of worthiness and tools to begin addressing it so you can feel more confident on your journey of living and sharing your purpose. 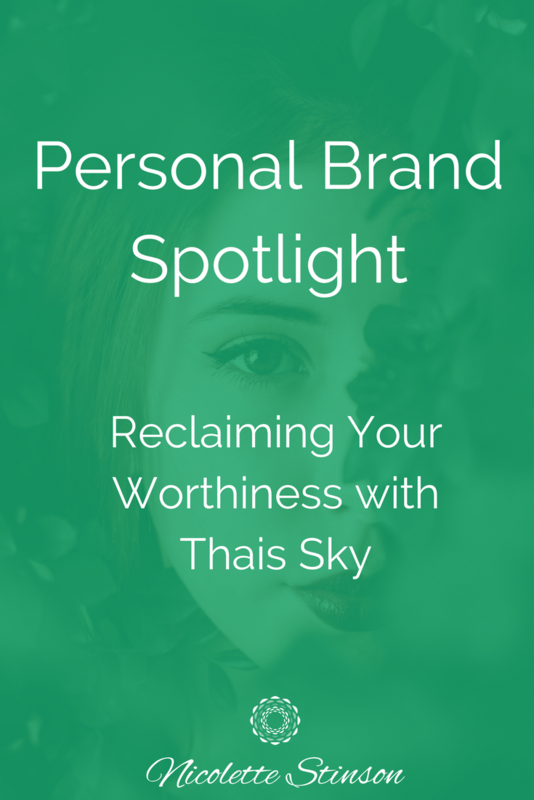 Meet Thais Sky: Two parts sass, one part straight up truth talk. Thais is an international speaker, writer, women’s leadership coach and feminist on a heart-led mission to support the seekers, the visionaries, and the "why the heck do I feel so broken” of the world reclaim their worthiness by learning how to explore, trust and express themselves unapologetically. She also hosts a weekly podcast RECLAIM where she offers conversations on finding the intersection of feminism and spirituality. She received a prestigious first-class degree in Management and has studied spiritual psychology, yoga, and leadership for over 10 years. Washingtonian Magazine named her as one of the top “8 bloggers to know.” The Huffington Post calls her “an inspirational woman” and she was nominated for Forbes Magazine 30 under 30 award. You can learn more about her and her online offerings at IamThaisSky.com and just about everywhere on social media, because #millennial at @IamThaisSky. If something inside this message resonates and moves you, please leave us a comment below, share your journey with us and others so together we can shed light on this often private and shame ridden journey of worthiness.